The ingredients’ list is exactly the same as that of the green papaya salad, except that I had replaced the main fruit to green mangoes instead. Apart from that, the concoction of ingredients and seasoning still follows that of the recipe from David Thompson’s “Thai Street Food” which works very very well for me. The mise place of the ingredients was already enough to make one’s salivary glands starts churning. The explosion of colours, not forgetting the wafts of aroma from the various ingredients, from the umami flavours of the fish sauce to the nutty roasted peanuts, the zesty zing from the limes and the herbish bouquet from chopped coriander. It was a feast not only for the mouth, but also the eyes and the nose. For me, the beauty of the salad is the balance of flavours in the dressing. It is really a melange of all sorts, yet co-existing together so beautifully. 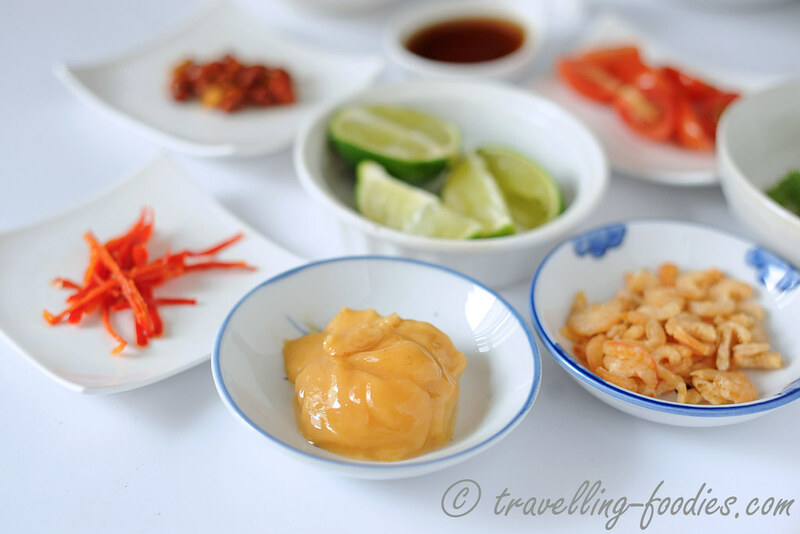 Thai palm sugar is a must for anyone who wishes for a more authentic experience. Apart from tasting sweet, it has a distinct aroma which makes it really unique and quite unforgettable. Apart from green mango, I’d also added some julienned cucumber for slight variation, It is really up to one’s preference, but I kinda like the mish mash of crunchy flavours from both mango and cucumber. 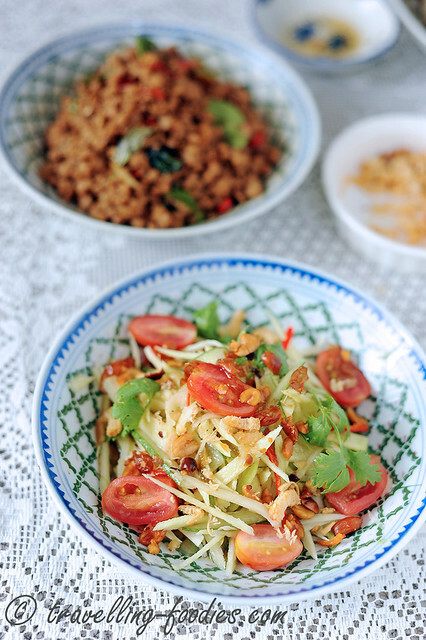 Usually, the cherry tomatoes are pounded together with the peanuts and dried shrimp. However for this preparation, I’d decided to keep it simpler and clean by flossing the dried shrimp with a food processor, coarsely chopping the roasted peanuts and leaving the cherry tomatoes intact in halves. But should you decide to go by the more traditional way of pounding everything together as described below, that would work out beautifully as well. Using a pestle and mortar, pound the salt with peanuts and dried prawns into a coarse paste. Add the lime juice, and cherry tomatoes to the mortar and carefully pound everything together. Next add the bird’s eye chilies, barely crushing them. The more they are pounded, the hotter the dish – and how hot you want it is up to you. Add them earlier if revenge is what you are after! Finally, add the julienned green mango and cucumber and lightly bruise with the pestle, while turning and tossing the mixture with a large spoon held in your other hand. In a small bowl, add palm sugar, fish sauce, more lime juice and tamarind water. Mix well to form a slurry. It should taste sweet, sour, hot and salty. 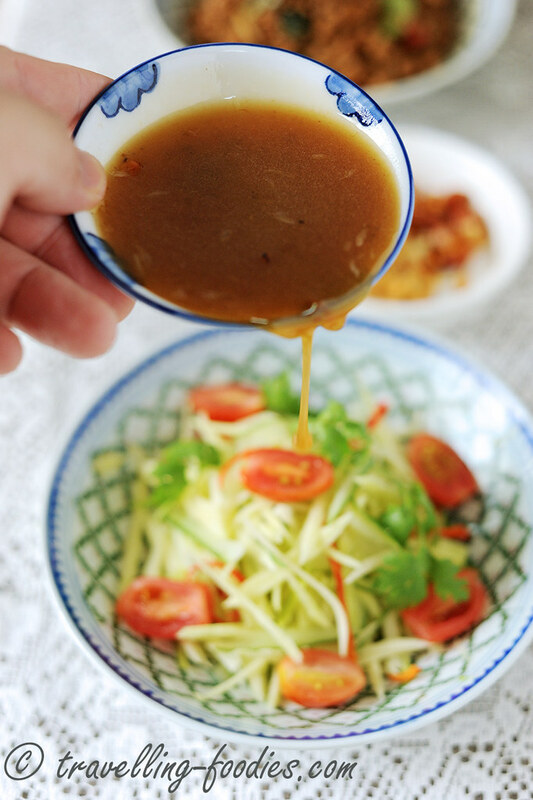 Drizzle the prepared dressing over the salad mixture and sprinkle with more crushed roasted peanuts as well as some chopped coriander leaves to serve. Place a wedge of lime on the side to be squeezed just before eating to heighten the aroma of flavours. 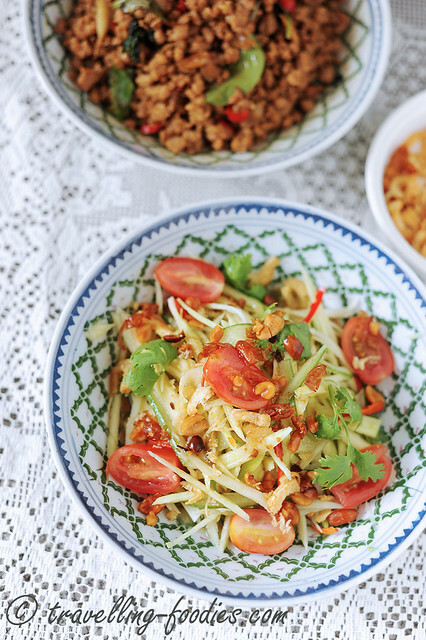 Please click here for the ส้มตำ Som Tam – Thai Green Papaya Salad recipe. This entry was posted on May 16, 2015 by Alan (travellingfoodies). 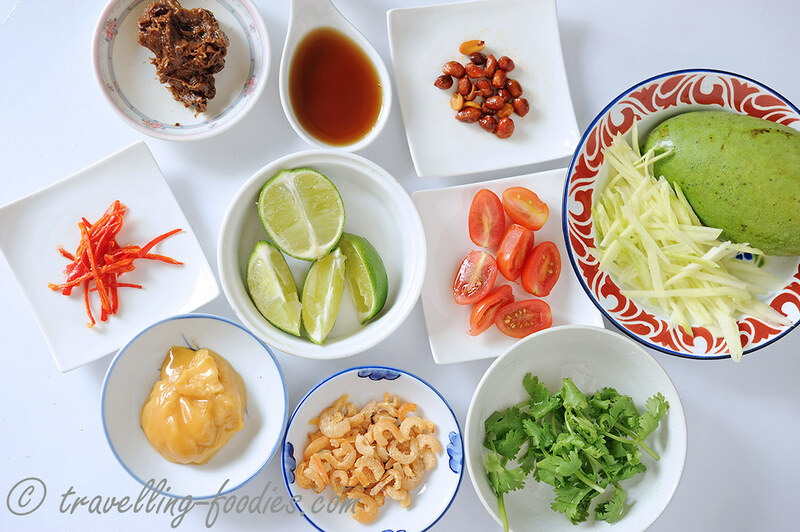 It was filed under Food, Simple Eats and was tagged with appetiser, bangkok, cherry tomatoes, chili, coriander leaves, dried shrimp, fish sauce, green lime, green mango, palm sugar, refreshing, roasted peanuts, salad, Som Tum Mamuang, starter, street food, tamarind water, Thai Green Mango Salad, thailand. haha time to make yourself some green mango salad! really fast and easy! Yeah. Seems easy and nutritious too. Thanks ya. is palm sugar gula melaka? nope it is not. it is much softer and more sticky than gula melaka. Over in Singapore, we get it at our local Thai grocers.